Our speaker next Monday at the Stamford is Brendan Bourke, who is with the Commerical, Marketing and Events Department for the Challenger of Record, America’s Cup 36. As one of New Zealand’s leading events executives, Brendan has worked on many major events including the ICC Under 19 Cricket World Cup, FIFA Under 20 World Cup, Triathlon World Champs, Volvo Ocean Race, Rugby World Cups in 2011 and 2007, and 2006 Commonwealth Games. Join us for a fundraising lunch with Kiwi singing legend Dave Dobbyn. You will have the opportunity to hear Dave perform and listen and ask questions to a panel chaired by a founder of Te Whakaora Tangata - a charitable trust based in South Auckland. Established in 2010 Te Whakaora Tangata, which means Life Restoration for the People, is successfully breaking the perpetual cycle of dysfunction and disadvantage in broken families. The three panellists for this event, who have been through the charity's programme, will include a woman who became a mother at 12 and a man in and out of prison for 35 years. This charity provides a three-month restoration course followed by mentoring for two years. It has positively impacted the lives of over 2,000 vulnerable children living in families overwhelmed by poverty, sexual abuse, drugs and violence. Whereas the total projected cost to the taxpayer for the most at-risk children is $270,800, Te Whakaora has a much more effective restorative record at a cost of approximately $24,000 per person. If you would like to attend, but haven't responded to the electronic invitation that has been sent out, then please let Jacqui in the office know. Term one at the London School of Economics has already come to an end (though in one sense, it seems like it only just started), and I have thoroughly enjoyed my courses. I took four this term: Regulation, Taxation of Wealth and The Use of Force, as well as a class on Social Security Policies from the Social Policy department (the LLM permits up to two non-law courses in the degree). I have been taking the opportunity to attend several public lectures at the University as well, which have been enormously interesting and varied. One of the most inspiring talks I attended was with David Cole (director of ACLU) and Philippe Sands QC (Professor and author) called Defending Liberty and Democracy in the Age of Trump: the role of civil society. Another really interesting one was by Ramachandra Guha (a historian), and he spoke on Gandhi's impact on the world. I have also joined a pro-bono group and a film society on campus and attend their events. The law school puts on some great events, and I am signed up to attend an annual weekend getaway at Cumberland Lodge in Windsor with the faculty and some students, where they have a series of talks on a wide range of legal topics. As you are aware, I used to specialise in retirement village law as a solicitor in New Zealand. One of my clients put me in touch with Associated Retirement Community Operators, which is an industry association of UK retirement village operators. They are looking at lobbying to adopt something similar the New Zealand legislative framework to regulate the industry here, so they were very interested in my experience. I now have a part-time job with them as a Policy and Research Officer, which I do one day a week during term time, and a little more (depending upon needs) during the holidays. It is really interesting to work in the same industry but from a different perspective, and I have been enjoying doing something in the "real world" outside university as well. Aside from the above, I am making the most of living in London and having access to fantastic plays and musicals. Highlights include a superb performance of Summer and Smoke (a play by Tennessee Williams), and seeing Tamsin Greig and Penelope Wilton (both screen actors) on stage in Harold Pinter's plays. I also really enjoyed The Book of Mormon, a hilarious musical. I have tried to make trips outside of London when possible - it is now very cold but on glorious autumn days I took day trips to two cute nearby towns, Hever and St Albans. Thank you once again for the Trust's generous contribution to my studies. Our temporary premises at Union Street have been received well. The most apparent highlight is the reaction to our community centre named Haeata (new dawn/beginning). In providing a nicer environment our clients are happier and are even in some instances dressing a little smarter. We are now able to provide highly nutritious meals and through the provision of good food we sense a calmer disposition from our people. Also, our professional team is delighted to be able to offer a safe space to enter the Mission, via a reception suited to servicing the Calder Centre & Crisis Care. Now we can quickly attend to those in a moment of crisis to offer them therapeutic assistance, away from the busyness and often unpredictable drop in space of previous times. Two of our staff have recently been on sabbatical – Dr Richard Davies won a Winston Churchill Fellowship to visit facilities caring for the homeless and vulnerable in the UK. He is working with a broader team to define a new model of care. Ilana, one of our Homeless Outreach Workers, spent time in the US and UK. Both say that the absolute necessity is to establish a trauma-informed care approach in all that we do, not really new to them, but reassuring that we are taking the right approach. From a demolition perspective – the site has been cleared of the old buildings, except for the 1850’s hotel, which will remain due to heritage restrictions. Each year, Rotary awards up to 100 fully funded fellowships for dedicated leaders from around the world to study at one of our Peace Centres. Through academic training, practice and global networking opportunities, this program develops the fellows into experienced and effective catalysts for peace. The fellowships cover tuition and fees, room and board, round-trip transportation, and all internship and field-study expenses. In just over a decade, the Rotary Peace Centres have trained more than 1,200 fellows. Many of them now serve as leaders at international organizations or have started their own foundations. The 2020 Rotary Peace Fellowship application is now available and we need your help to find the next cohort of experienced global peace and development leaders! Candidates have until 31 May to submit applications to their District and Districts must submit endorsed applications to The Rotary Foundation by 1 July. General inquiries regarding the fellowship program may be sent to rotarypeacecenters@rotary.org. 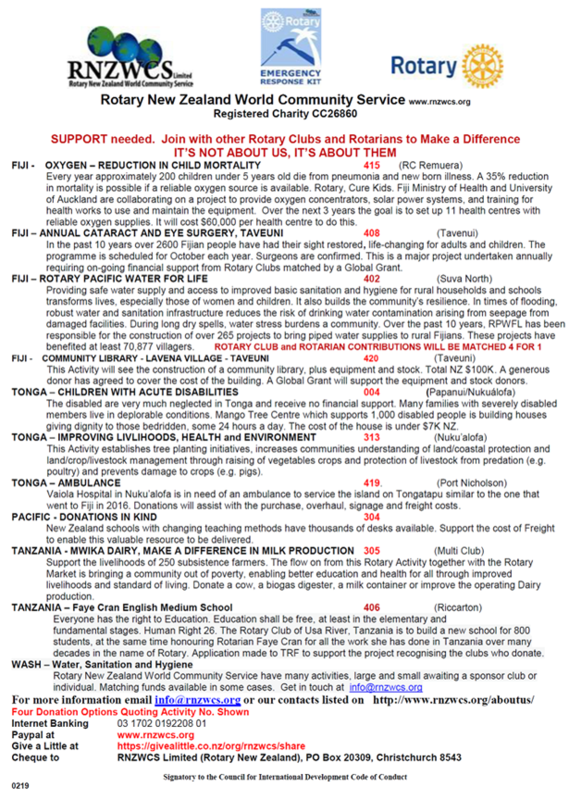 The next Rotary Leadership Institute (RLI) is on Saturday 30 and Sunday 31 March and will be held at Selwyn College. We encourage all new and existing Rotarians to attend, and especially those who will be taking up leadership roles. This is an opportunity to learn from others, share ideas and challenge your thinking; discover more about Rotary and Rotaract and how this knowledge can help you contribute to your community, as well as providing an opportunity for personal growth. If interested in attending, please contact Jacqui in the office, who will provide you will all the information you will require.